Italian Interior Minister Matteo Salvini, the most popular politician according to all recent polls, has been placed under formal investigation after a judge ruled that as per European law, he had basically ‘kidnapped’ the African immigrants on the Italian coast guard vessel the Diciotti which Mr Salvini refused to be allowed to disembark. Related coverage: <a href="http://thegoldwater.com/news/34942-Italy-Migrant-Ship-Row-Government-Will-Not-Give-20-Billion-Each-Year-To-The-EU-Video"> Italy Migrant Ship Row - Government “Will Not Give €20 Billion Each Year To The EU” (Video)</a>. Mr Luigi Patronaggio, chief prosecutor for the Agrigento region on the Italian island of Sicily, had visited the ship and questioned its passengers. 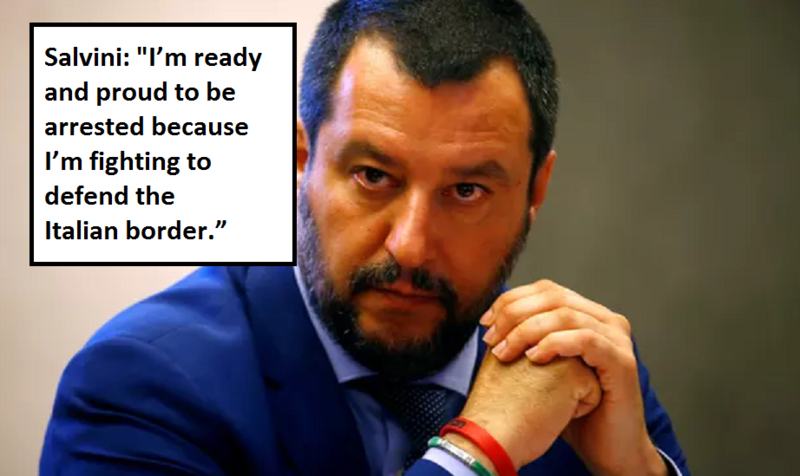 Afterwards he sent magistrates to the capital Rome to question Interior Minister Salvini, several members of his staff and at least two high-ranking officials. He then launched a formal complaint on which a Sicily judge now ruled that the Interior Minister will be placed under formal investigation for ‘kidnapping’ charges. On Friday, the Italian government had threatened to stop paying its yearly fee of €20 billion to the EU if other member states refused to take on their fair share of refugees that arrive on a regular basis via boats in Italy. He should 'release' them into shark-infested waters; if they make it back to Italy, toss em back in again. These 'people' are human-sized parasites, and should be treated as such. exactly…. drag that globalist-filth judge into the streets to be hanged and hang his family with him just to be safe. anyone see a correlation to what the globalists are doing to, Trump? To think, the European officials aren't elected and most everyone doesn't know who they are. Someone should find this info out and disseminate it on the Internet. They can't afford to watch them all.